Though the health industry has, in many respects, been slow to adopt new web and mobile technologies, it seems we may finally have reached a tipping point. This is perhaps best demonstrated by Manhattan Research’s report, which found that 72 percent of physicians owned a smartphone in 2011, with adoption potentially reaching 85 percent by the end of this year. With doctors increasingly carrying smartphones and tablets at the point of care, Borna Safabakhsh says that he is confident that the timing is right for medicine to finally take advantage of the breakthroughs in web and mobile technologies. Safabakhsh is the co-founder and CEO of Agile Diagnosis, a Y Combinator and Rock Health-incubated startup, which is today launching a beta web and mobile platform that aims to help doctors better diagnose their patients. While this may initially sound like a next-gen WebMD, Agile Diagnosis isn’t intended to help consumers self-diagnose, although the team may get there initially, it’s just for doctors, nurses, and medical students. To that end, Agile Diagnosis gives clinicians a central place in which they can gain realtime access to evidence and consensus-based best practices (or clinical guidelines), so that they can help diagnose their patients not just based on scientific literature, but with the help of other doctors who have correctly diagnosed the same or related symptoms, for example. This is then obviously made available through cross-platform web and mobile apps that enable doctors quick access to those guidelines at the point of care. The startup’s CEO said that, while there are quite a few medical reference apps on the market already, most of those are “more or less an eTextbook.” So, what sets Agile Diagnosis apart is that it includes access to a full repository of quality and credible medical information not only from medical literature but doctors themselves, surfaced by its own clinical algorithms, as well as a user-friendly mobile interface and design. That means that, visually, Agile Diagnosis’ tree format was designed to make clinical guidelines and medical information easier to digest and thus more actionable, as compared to the apps and web services that come densely-packed with text — the same format that has plagued medicine for decades. The co-founders tell us that an estimated 50 percent of patient visits fall below the standard of care, and that one in seven patients are misdiagnosed. That’s alongside the tens of billions wasted on unnecessary testing and inappropriate treatments — in the U.S. alone. While doctors have long had access to enormous online repositories of medical journals, texts, and research, medical data has not historically been organized into a digestible format for physicians. It’s either check out WebMD or read a detailed, 70-page article — the options have been limited. What’s more, on average, doctors only have 7 to 10 minutes per patient. That’s not a lot of time to make the right decision, and certainly not enough time to comb through medical journals. 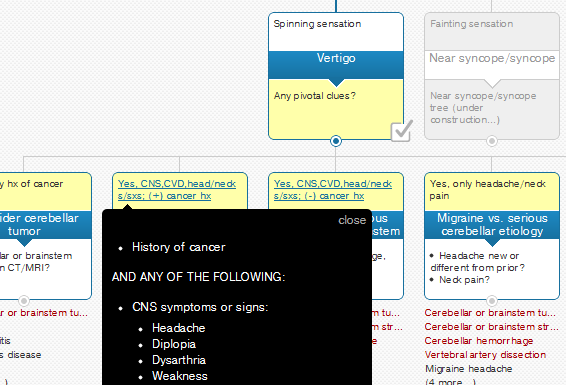 So, Agile Diagnosis’ web and mobile platforms offer doctors contextual information (along with lists of references that provide hyperlinks to primary and secondary literature) for each diagnostic and care-related decision they make, which allow them to explore alternatives to find the right solution. Because a doctor’s process begins with the differential, Agile Diagnosis has developed a dynamic differential which updates in realtime to make them aware of the particular diagnoses that are driving decisions in the medical community. This enables physicians to hone in on the differential using evidence-based tips, including sensitivities, specificities, likelihood rations, and post-test probabilities. All in all, Agile Diagnosis is looking to give doctors the ability to give better, more accurate care in less time, while in turn enabling patients to gain improved health and a higher quality of care, leading to fewer unnecessary tests, treatments and bad outcomes. The startup is a graduate of Y Combinator’s 2011 summer class — was thus a recipient of SV Angel and Start Fund’s joint offer of $150K in convertible debt to each member of the class — and is currently a member of Rock Health’s second batch of healthtech startups. 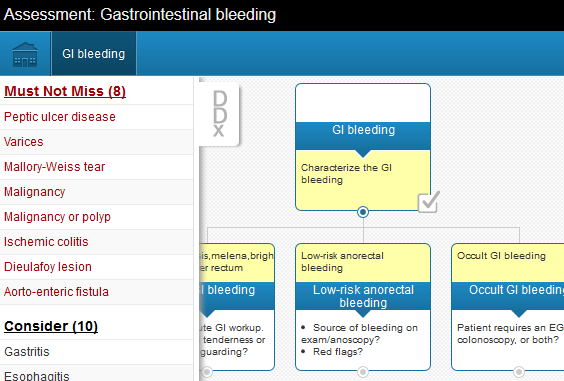 Agile Diagnosis’ first mobile offering is an HTML5 web app that is built for tablets (specifically for the iPad). An iPhone app is in the works and should be available later this year. The current beta is free, but the co-founders said that they plan to convert to a paid subscription model in the future. For those doctors, nurses, and medical students interested in checking out Agile Diagnosis’ interactive visual guidelines, check them out here, and apply for access with the code “TECHCRUNCHDOC”.